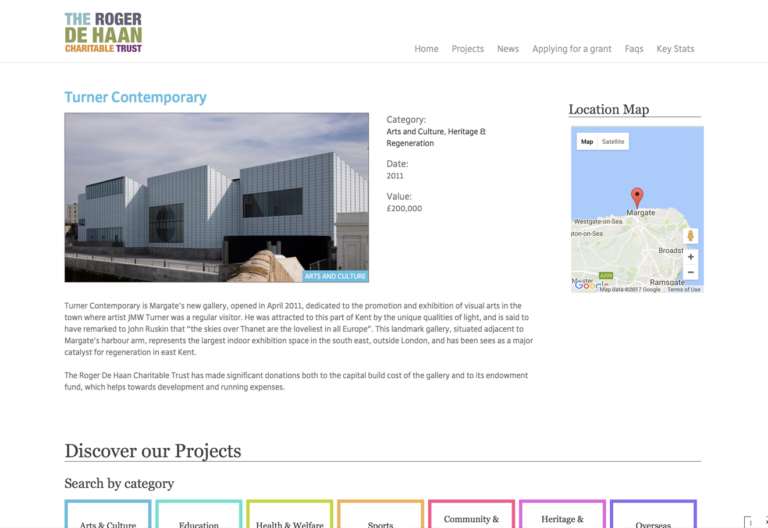 The Roger De Haan Charitable Trust funds a huge range of culture and community projects in Kent, mostly around Folkestone, Hythe and Romney Marsh – as well as internationally. 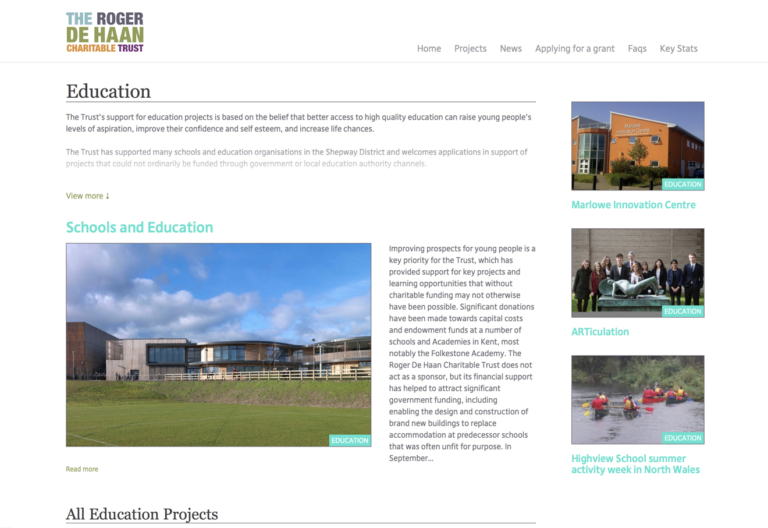 After creating a brand for The Roger De Haan Charitable Trust they brought us in to create a new website to communicate the great work the Trust is supporting through it’s funding. Their existing site was inflexible and hard to update, it was our job to reverse this situation and at the same time make a responsive website so the content presented itself well on any device. After discussions with the stake holders it became clear that the new website’s core focus was to communicate the Trusts activities. The aim was to express the work of the charity and give exposure to the projects they fund. We decided on a two pronged approach, a categorised projects section as a ‘funding portfolio’ and a news section for more incidental news about funded projects as they developed. 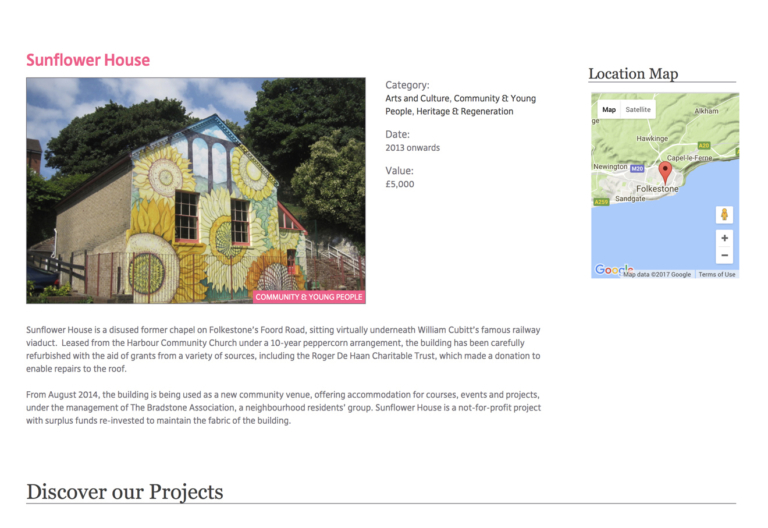 The design followed this thought process with a series of landing pages displaying larger features with images at the top, followed by smaller ‘stories’ below. Much like a newspaper’s cover. To ensure all this content is easily accessed we created a category structure for the projects with striking, colourful buttons which stand apart from the minimal design of the rest of the site. We also implemented an auto-completing search tool so the user can easily find projects by their title, independent of their category. We modernised their application process with online application forms that save into the website’s database, easily viewed and downloaded from the WordPress admin. In addition to this the application is emailed to the Trust as well as the applicant. These automated processes have eased the internal admin, never a bad thing! We are great believers in WordPress, both from a development, and an ease-of-use point of view. We were confident it would solve the frustrations our client had with their old website’s awkward CMS. So we set about integrating it into our templates, building custom post types for good data separation and modifying the admin to reflect the needs of the site’s content. Lastly, we provided in-person training and backed it up with some short video tutorials on each admin task. And if all that fails we are at the end of the phone to help!